For these two weeks I will be sharing those reflections in no particular order. This second reflection was published on July 27, 2010. As promised, this last reflection is mine. I am missing a few reflections I requested; but I can respect that others do not want to share their inner most feelings in a public forum. When Alex was born I felt like a failure. I could not believe I had created a “flawed” baby. I was embarrassed, humiliated and ashamed. I did not want to tell my parents or parents in law; I felt they would blame me for having a baby with down syndrome. 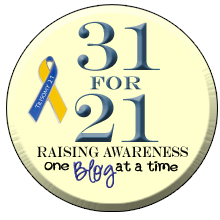 I did not want to tell anyone that in most cases the extra chromosome comes from the mother; I felt like I had let down my husband, my 15 month old daughter and my family. I was scared to death. This lasted for about three days. In that time I met Alex, talked to professionals and told my family. Alex was beautiful and looked just like any other newborn I had ever seen. Granted, she did have a few odd features, and we could tell she was different, but she still had features of our family. She cried, ate and pooped; she didn’t look like an alien and we loved her. The professionals we talked to explained a lot about down syndrome to us. 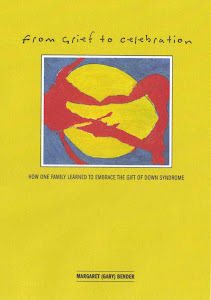 I remember one pediatrician who came into my room at the hospital and asked me if I knew anything about down syndrome. I remember saying to him all I knew about down syndrome was “they all looked alike”. He was incredulous and said to me that was ridiculous and that was the same as saying all white people look alike. I felt like I had been slapped and vowed at that moment to never make gross generalizations again. My family was incredible. My mother came out on the first plane from New Jersey and stayed for almost two weeks. The first week while Alex was in the hospital we did a lot of research; read books and went on a field trip to a local residential facility called Lamb’s Farm. I remember walking into the jelly and jam store on site and talking to a 20 something girl with down syndrome. After I said hello she spent about 10 minutes talking about her love for country music. She was polite, charming and poised. It was eye opening and encouraging. The rest of my family, as well as John’s, were supportive and helpful. I imagine it took everyone time to get used to Alex, but there has never been any overt signs of disappointment or disapproval. She is fully accepted and included in both our families. Once we got used to Alex, and the idea of having a baby with down syndrome we never looked back. I have written of many of our challenges and triumphs. I have talked about the magic of Alex; the pure love she has brought to our lives. Her struggles to be like her brother and sister and her frustrations when she cannot be. I don’t claim it has been easy, but it certainly has not been hard. I know I have said this before; Alex has enriched our lives in a way I never knew existed. We have learned compassion, caring, and acceptance. We have met incredible families who have children with special needs, as well as many others with special needs. We have met caring and skilled professionals. I feel honored to have this opportunity in our lives. Alex has touched many people in her life and will continue to do so. One final thing; many people say to me that Alex is “high functioning”. I do not think this is the case at all. We have been lucky with Alex’s health; many children with down syndrome who are born with serious health issues can be seriously delayed while operations and other medical interventions take precedence over early intervention therapies. These kids do catch-up but at a slower pace. I think in today’s world, when we expose our children with special needs to opportunities and experiences that all children should have, we fulfill the promise of their future. I did not do anything with Alex that I did not do with my other kids. Yes, I am pushier and more insistent on inclusion and equal opportunities, and yes, I monitor her education aggressively. But just like Courtney and Tom, Alex has done the rest, and all she needed was an advocate. In many ways, I feel like the guardian of this extraordinary individual, the steward of her life, the protector of her magic. I am not sure what I did in a previous life to have Alex included in my current life; but it must have been something great. I am not sure I can top it!